LaOficina adhesive tape with durable plastic material made which is durable and sticky. Transparent adhesive tape is widely used for enveloping box, letter, school, company and home. Easy to use and compact to store. Clear tape measures 0.7 inch (18mm) in width and 32 yards in length of each roll, 24 rolls of each pack. 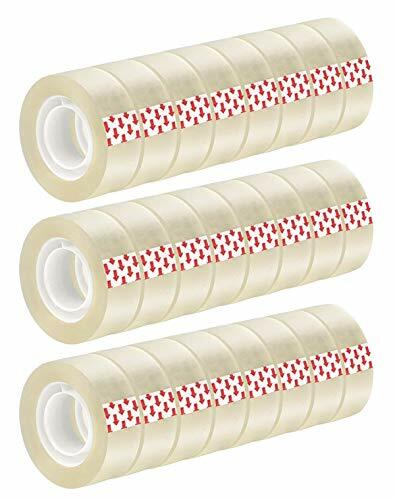 Transparent stationery adhesive tape are made from durable plastic material which features firmly stick onto most surface, like paper, metal, plastic etc. Transparent tape is the perfect clear tape for wrapping, sealing, and label protection. An economy-grade transparent tape with a glossy finish for basic office and home uses. Our clear tapes does not yellow or dry out give you a sharper look, and protects your projects from continued rips and tears over time. If you have any questions about this product by LaOficina, contact us by completing and submitting the form below. If you are looking for a specif part number, please include it with your message.